I manage my own environment with Ansible, which is really great! This yaml format describing what you want to do is easy to read, understand and even easy to maintain. If you can automate an specific action or just simply executing commands one by one, you can do it with Ansible. When you try to combine them, you’ll notice that every ansible run for executing the puppet agent command fails. (No worries, I was there before .. 🙂 ) When an puppet agent runs, it ends with different exit codes. Normally when an script, program or commands ends successfully, it has an exit code of 0. Ansible uses this to determine if an action is ok, changed or failed. But puppet uses it slightly different. Provide transaction information via exit codes. If this is enabled, an exit code of ‘2’ means there were changes, an exit code of ‘4’ means there were failures during the transaction, and an exit code of ‘6’ means there were both changes and failures. - name: "Start puppet agent"
The first task is the most important one. We register an variable, which will be used in this task for checking exit codes. 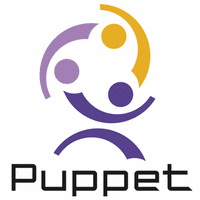 We let Ansible know that if the exit code of the puppet agent command is an 2, the task will be “changed”. If it is something other than 0 or 2, it is failed. Thats all! The 2nd task is actually only showing us some information when the first task is failed. I only want to see the output when the puppet agent run fails for some reason. You don’t have to use this task, as this only prints some information. Ah, I made an error in my manifest.